The Academy convened in The Gallery on December 11 for its annual End of Year Review and Reception sponsored by Alan Baxter Associates. With an attendance of over 60 members, old and new, the meeting reflected on the events and programs of 2013 and led to lively and constructive discussions on the Academy’s future. Along with conferring on the year’s Awards Ceremony and publications, Congress events, and various successful site visits, the attendees learned about the exciting and successful inaugural year of the Young Urbanist membership programme. 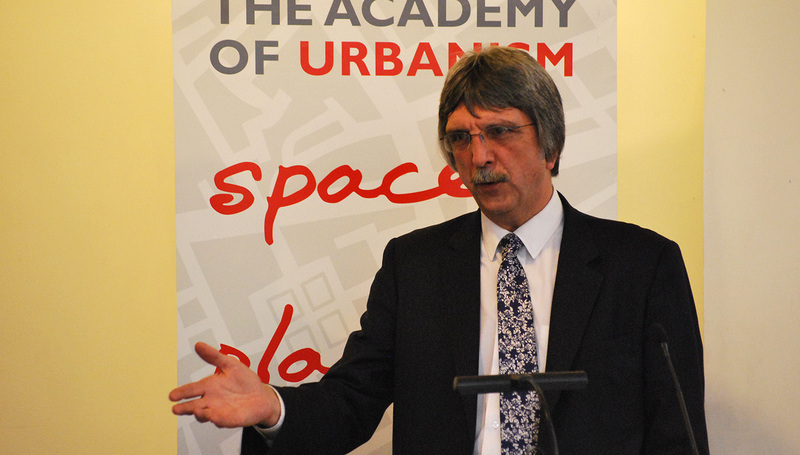 We were delighted to be joined by Steve Quartermain AoU, Chief Planner at the Department for Communities and Local Government, who masterfully wrapped up the event with his insightful revelations on the existing challenges and opportunities of British planning in a talk titled ‘Theory is Great, Practice is Harder’. Urban and regional planning as a field, he mused, is exciting and unique in its interdisciplinary scope, as it draws on the expertise of practitioners from a multitude of backgrounds; the private sector, architects, public health officials, academics, social workers, etc. But how do planners decisively mitigate the wide array of agendas, whilst accommodating public concerns? Roadblocks towards implementation arise when multiple and varying definitions of success cause confusion and ultimately indecision. These hurdles, he claimed, are unfortunately implicit in the system as we know it, and though there are ways of working around them, this reality calls for a radical probe. Critical and creative reassessments of the mechanics of decision-making, governance structures, value systems, and procedural dynamics are needed to redefine the planning practice. Perhaps, Quartermain claimed, we need to think the unthinkable. In the Q&A session following Quartermain’s talk, it became clear among Academicians that the planning culture in Britain has remained relatively stagnant whilst the make-up and dynamics within society has changed around it. The increasing influence of the private sector over public sector directives and funding, in the wake of an economic breakdown, and with additional challenges of the growing diversity within communities, creates a whole new breed of challenges that planners must adapt to. Many insights of practical experiences shared amongst the attendees – from planning theory, to consultation, to implementation – emphasised the heightened pressure to invigorate the field with new, creative intervention possibilities. Recognising these challenges, the session concluded with an optimism that the networked activities of the AoU may help to generate these solutions.